Lately, I have been seeing print and television ads for “complex” divorces, implying that some divorces require special handling by only those certain lawyers. 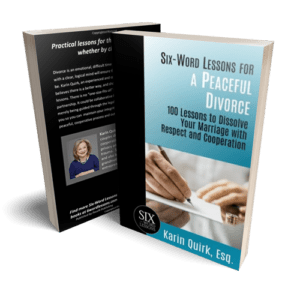 Sometimes folks approach me and tell me they would like to engage in a respectful, cooperative divorce but their situation is too complicated. So when might a case be too complicated for an amicable resolution? Surprisingly enough, a case is not more complex because there is a lot of money involved. Some of my most difficult cases are ones where there simply is not enough money to go around. Often there is a great deal of rancor or the parties are really desperate and can’t seem to find a peaceful resolution. On the other hand, a couple that has substantial assets can work very well with a Certified Divorce Financial Planner (CDFA) or even their own investment advisor to work out a reasonable resolution and division of assets. So a divorce involving a lot of money need not be “complex” and certainly can be approached in a cooperative manner. A family business can be a little more challenging. I have seen small businesses destroyed by divorce because the process was so invasive and time-consuming. If a family business is involved there is even more impetus to a cooperative approach. A neutral business appraiser can be engaged to help the couple determine a reasonable value for the business and the couple can determine a way to divide assets in such a way that the business remains viable. Some people believe (or have been led to believe) that a divorce is complex if there are children involved and the parents are not in complete agreement on a parenting plan. Again, (is there a theme here?) it is advantageous to approach a divorce with children in a cooperative manner. I often engage a mental health professional who specializes in children to help the parents determine a parenting plan that is child-centric rather than parent-centric. The children certainly will be much better off if their parents can demonstrate that they can resolve differences in a respectful manner. The cases that are extremely challenging is if there is domestic violence or impairment by drugs or alcohol. (I mean serious impairment, not just one party drinks more than the other). While I do know of instances that have had amicable resolutions while dealing with domestic violence or mental impairment it requires a great deal of commitment on the part of the party impaired or the violent one. Unless they agree to treatment there is no opportunity for cooperation. In these cases, I have a referral list of lawyers who will not make it worse and will treat their client with respect. You won’t find these lawyers in a TV ad. So there is my bias toward respectful cooperative divorce. Most likely your divorce is not too complex for this approach.